Stratford NRC.50+™ is rated 5.0 out of 5 by 1. The Stratford NRC.50+™ Acoustical Ceiling Tile System gets you good acoustical performance and great esthetics at a price that's worth shouting about. Classic style and a multitude of color/finish options, coupled with a respectable NRC rating of 50% and an STC of 13, means that an acoustic ceiling doesn't need to equal ugly anymore. Still not convinced? Read on! An NRC of 50% (about the NRC of your average mineral fiber ceiling tile) means that 50% of the sound that hits the ceiling is absorbed and will not bounce back. Interior spaces like home theaters, restaurants, and even medical/therapeutic offices (where privacy is important) would benefit from an increased NRC. Starting at just $3.25 per square foot (delivered! ), prices actually go down as your order volume goes up. We all like the sound of that! This classic design comes in five premiere colors, three better than tin finishes, and three faux wood grains. A beautiful ceiling that actually enhances your room's appearance while improving its sound, imagine that! 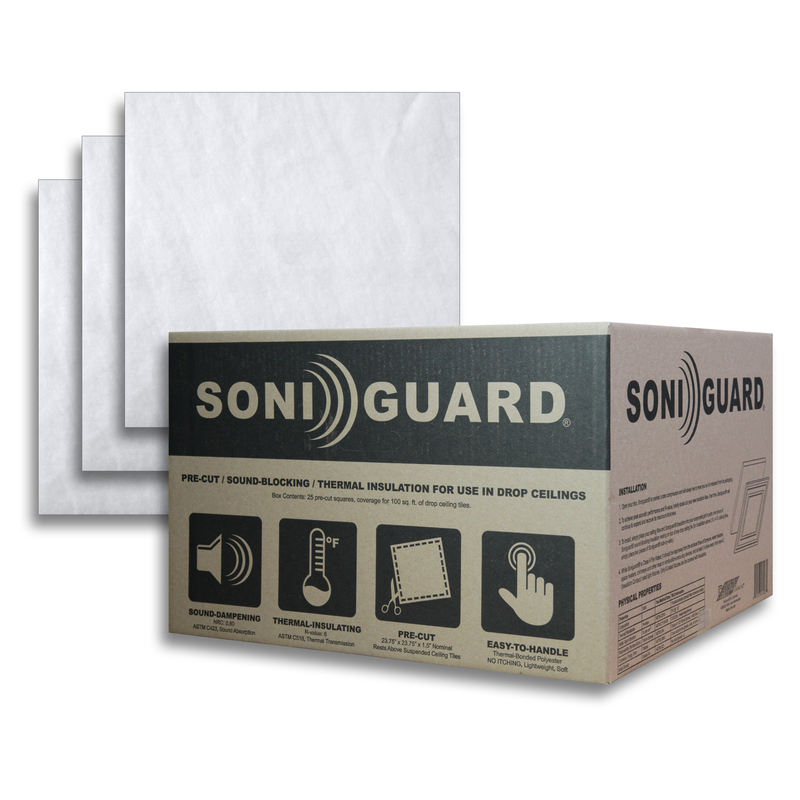 Shipped as a set - perforated tiles in one box (beauty) and sound absorbing insulation in the other (the beast) - the Stratford NRC.50+™ 24" x 24" acoustical ceiling tile system is perfect for 1" standard T-bar grid systems and will not stain, absorb moisture, harbor mold or mildew, or create dust. Because it's two separate components (rather than a composite of dissimilar materials that are glued together) each piece can be removed separately, cleaned separately, and even recycled separately. No other acoustical ceiling system gives you that flexibility. 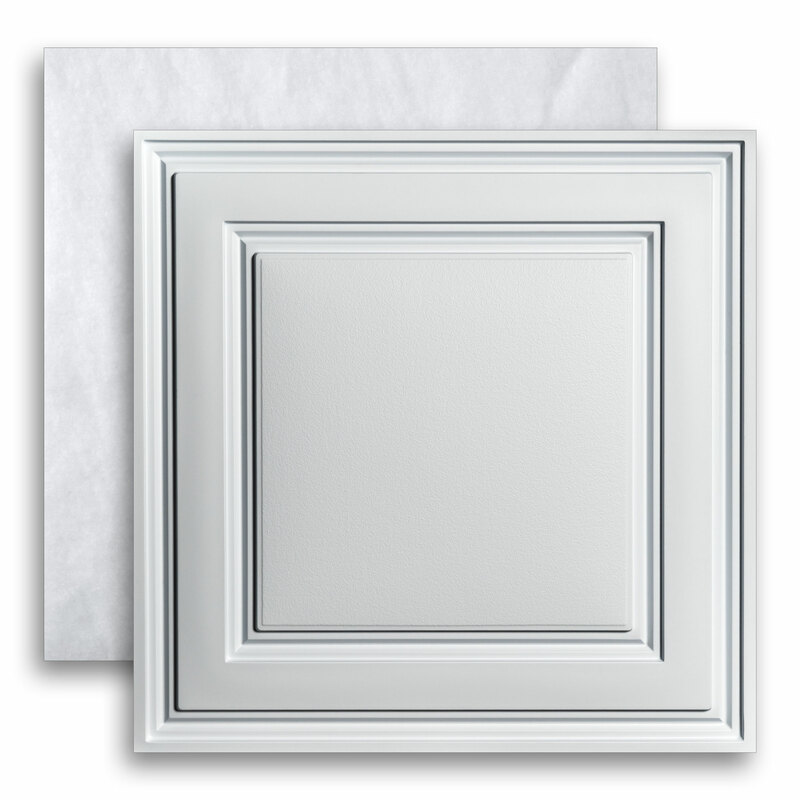 Lightweight, flexible, simple to install, easy to trim with household scissors (or aviation snips), and Class A fire rated, the Stratford NRC.50+™ Acoustical Ceiling Panel System gives you one more benefit that won't just save your ears, it will save on your utility bills. By adding an R-Value of 6 to your drop ceiling, NRC.50+™ will make your space warmer in the winter, cooler in the summer, and quieter all year long. Can you glue these to popcorn ceiling? Ceilume's Stratford NRC 50+ is a 2 piece system consisting of a Stratford ceiling tile and a piece of Soniguard Drop Ceiling Insulation. It can only be installed in a standard 1&quot; or 15/16&quot; ceiling grid. While Ceilume does make many Glue-Up ceiling tiles, none of them can be installed directly to popcorn ceilings. The random texture of the popcorn finish prevents the tiles from sitting flat against the ceiling and make the joints uneven. Are the white tiles paintable? If so are there any recommendations on type of paint, method, etc? 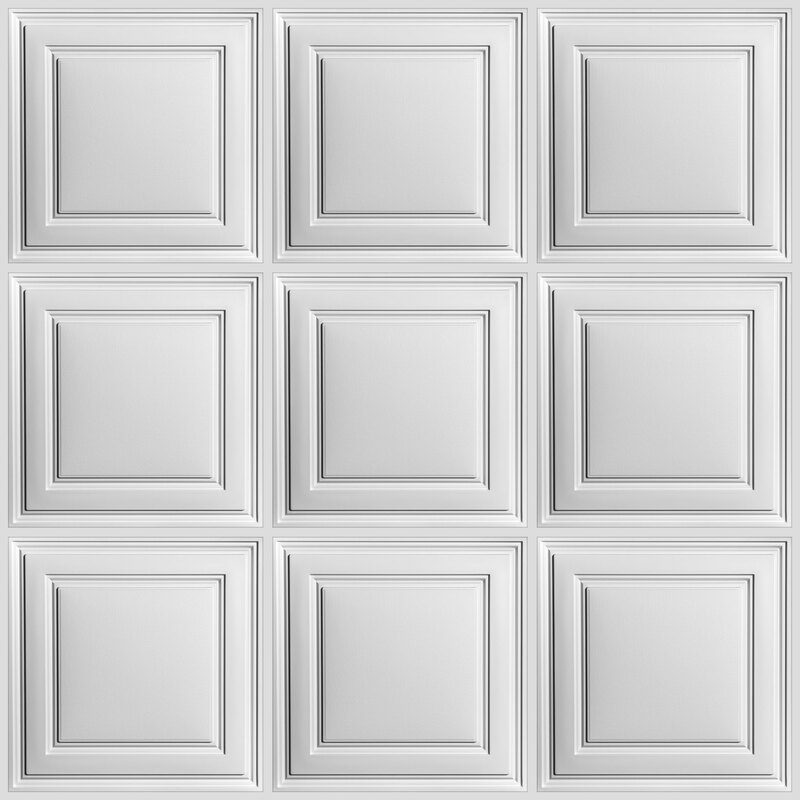 Yes, you can paint Ceilume ceiling tiles with an interior grade latex paint. Ask your local paint pros to for a latex paint that works well with vinyl. How visible are the perforations in this tile? The perforations in the NRC.85+ are obvious from the online photos, but the NRC.50+ looks just like the regular Stratford tile in the photos. Can you send a close-up photo of one of these tiles to my email? Rated 5 out of 5 by Dave from Looks great - easy to work with This tile looks great - much nicer than standard ceiling tiles. I used a general contractor who had never seen this tile - they were also impressed with its ease of install and how nice it looked. Buyers should make sure to plan on using "ceiling grid mounts" for accessories like speakers etc. that are to be installed in the ceiling as these tiles will not support any weight. 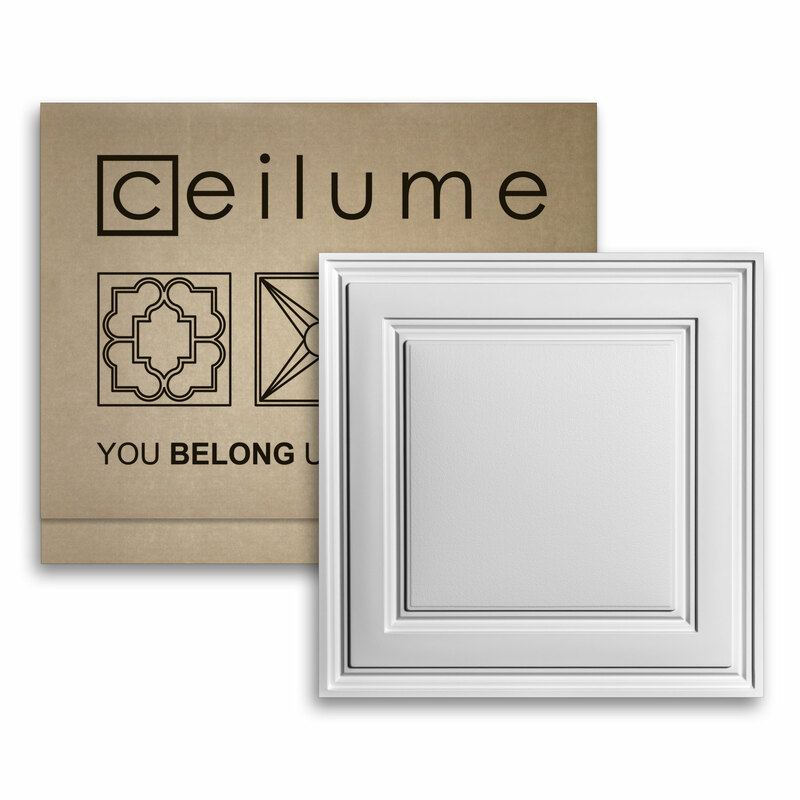 Ceilume was a great vendor to work with: very helpful support and fast shipping.